Yesterday at our sister blog, Yen for Living, we posted an article about big cars that probably needs some clarification. By no means are we fans of big cars and, in fact, we sort of denounced cars in general when we sold ours in 2006. We aren’t necessarily against cars in principle, but the automobile is privileged way too much in Japan and America (we can’t vouch for Europe and the rest of Asia). 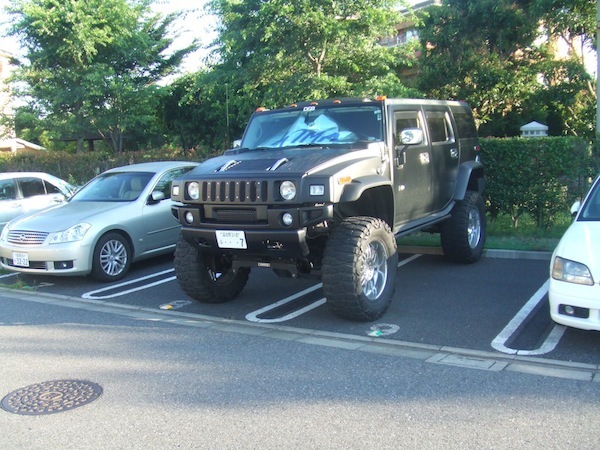 We simply wanted to comment ironically on what we thought was the strange marketing logic of GM, and also wanted to use this photo of a Hummer that is parked not far from our apartment. The fact that the owner needs to rent two parking spaces says a lot about Japan’s car-ownership situation, though it should be pointed out that these spaces only cost ¥4,000 each. For another look at how parking explains Japan’s car-ownership situation, after the jump is an article we wrote for the Asahi Shimbun in 2004, when we were still car owners ourselves. The most important socioeconomic aspect of life in Japan is the premium placed on physical space. Other countries in Asia are more crowded, but unlike Japan’s their citizens do not enjoy a standard of living commensurate with America’s and Europe’s. The relative lack of space limits the Japanese people’s ability to exercise their consumer impulses, but exercise them they do. Take motor vehicles. Japan’s automotive industry is second only to America’s, which means the Japanese are encouraged to buy and drive cars even though there isn’t enough space for them. The government can build all the highways it wants, but it also has to take into account the fact that sometimes those vehicles need to be at rest, and there isn’t enough space for the millions of Japanese cars to do that, at least not all at the same time. When you buy a car in Japan you have to show proof that you have a parking space before the dealer will register the car and release it into your possession. If you own your own residence, you have to produce your floor plan. If you rent a space, you have to bring proof from the landlord. Though newcomers to Japan, especially Americans who tend to think of car ownership as a Constitutional guarantee, may look upon this rule as yet another niggling bureaucratic annoyance, it makes sense. In fact, it doesn’t go far enough since it only covers cars at the time of purchase. Once you have registered your car, you never have to re-register it, no matter how many times you move, which means that when you do move you aren’t required by law to secure a parking space. The regulation itself is a good idea, but without consistency of application it’s meaningless. Such consistency would have saved me a lot of trouble when I moved to Saitama in the early 90s. At the time, I had a car and was looking to move out of my small apartment in Kawasaki and into a house. The location of the house didn’t matter as much as the fact that it have a parking space. An acquaintance who lived in Omiya told me of a house-for-rent and I contacted the owner. There was no parking space, but there was a small prefabricated structure attached to the house. The structure was delapidated and dangerous so I convinced the landlord to destroy it so that I could use the space for parking. To access the space, I had to go down a short, narrow street and make a sharp turn to the right. The street had no curbs. It was simply a stretch of gravel and concrete between two rows of houses. My house was at the end. After the prefab was destroyed and I started using the parking space, I awoke one morning to find that my neighbor across the street had, overnight, erected a fence literally in the middle of the street. He had driven metal posts right into the concrete. Because of the position of the fence and the angle of my parking space, it was impossible to maneuver the car into the space without a lot of backing-and-forwarding. I did not confront the neighbor but called my landlord. He later told me that the street between the houses was not public property–the concrete covered the invisible divide between the neighbor’s land and mine, and that the neighbor had simply placed the fence on the edge of his land. Why he did so became obvious. The neighbor did not have a parking space, either, but simply parked his car in front of his house on the street. Having noticed that I was going to use this same street as a driveway he decided to preemptively guarantee his own space. My landlord was upset, not because of the neighbor’s handiwork, but because he realized he had destroyed the prefab for no good reason. (When I eventually moved out, he tried to subtract the cost of destroying the prefab from my security deposit.) In any case, he refused to talk to the neighbor about removing or altering the fence. He felt it was the neighbor’s right. In the end, I had to rent a space about ten minutes away from my house by bicycle, and consequently I didn’t use the car as much as I might have had the space been right next to the house. The parking problem turned out to be a blessing in disguise. Owning a car in Japan, I realized, is sort of stupid. Don’t forget to tell people in the states, that is very wise to pay for a parking space for your BICYCLE( app 2700Y a month), if you want to park your bike near the train station. Learned that the hard way, a few times when the city came by, clipped the lock on my bike, took it to a huge warehouse, and forced me to pay a fine to get it back. Oh those were the days. As for owning a car in Japan, stupid perhaps, but oh so convenient at times. By the way, I remember back in 1990, ALL the cars were white. Almost 95%.